It's that time of year in Japan, where the Japanese companies are all in the midst of reporting their second or third quarter (depending upon fiscal year) financials. Not everyone has reported theirs, but the news has been consistent so far: negative with one exception. Canon reported lower than expected sales and profits, with printers (of all sorts, consumer and business) driving a lot of that. But Canon also reported that delays in interchangeable lens camera releases (probably the EOS M and 6D) resulted in fewer such sales than forecast. Also, their compact camera business was reported to be down 21% year-to-year, which puts even more pressure on interchangeable lens camera sales. Canon is one of the healthier of the companies involved with imaging, but it struck me that they were making fairly strong noise about slowdown in Europe and the continuing slide of the Euro to the yen. Both those things put enormous pressure on the company overall, as we're talking about a potentially double-digit change to profit numbers (percentage-wise). Sony's report didn't break out mirrorless cameras, but their compact sales have declined considerably, and Sony has apparently now lost one of the top two spots to Nikon in compact sales. At a separate event from the financial results presentation, Sony Imaging executives once again made the claim that NEX sales were the overall leading mirrorless seller worldwide, but I haven't seen the specific data that would back up that claim. Overall, imaging (which includes video, including professional video) dropped 17% in overall sales year-to-year and had an 84% reduction in profitability. Fujifilm doesn't break out camera sales at all, though they did make a statement that their market share improved despite declining sales (that's mostly about compact cameras, not mirrorless). Curiously, Fujifilm didn't make a positive statement about X camera sales as they did in past reports, only a statement that they released new X models. Overall, Fujifilm's imaging business (which includes film and photo processing materials) is still losing money. Meanwhile, Panasonic appears to be a mess. Restructuring already in progress is costing them eleven times what they thought it would, and the dwindling TV business is really dragging their overall results down as they attempt to restructure, with almost a US$10 billion loss this year (most of that coming in the current quarter being reported). Digital camera sales are significantly off, and if that weren't bad enough news, Panasonic's m4/3 cameras are losing market share in Japan, a key market for them. Panasonic started the year with a fairly consistent 30% market share in mirrorless cameras in Japan, but is ending the year on a downer: last months' market share was 18%, and things have been on a constant slide since May. The GF5 and G5 are not holding serve. The sole exception to all the "down" news in the camera business is Nikon. Nikon reported increased camera sales in every segment (DSLR, interchangeable lens cameras, lenses, and compact cameras), though they missed their original estimates slightly in the last two categories. Even more stark in contrast to the others is that Nikon is showing a 12% gross profit margin on cameras where most of the others (Canon is an exception) are showing virtually no profit or a loss. The overall camera market this year is expected to be about 99 million units of all kinds of cameras, 17 million of those interchangeable lens cameras (and about a third of that mirrorless cameras). Nikon has now increased their market share of all cameras to 24%. An interesting thing to do when analyzing camera company financials is to take the BCN numbers for retail sales of interchangeable lens cameras in Japan and see if that tells you anything useful (I also do the same thing for IDC numbers in the US, but those haven't been reported yet). BCN counts customer receipts at about 40% of Japan's retail establishments, and is a fairly reliable indicator of what is actually selling in the country. Note that what the camera companies report is what they sold into subsidiaries and distribution, not actual customer sales. First off, we find that mirrorless is a little less than half of the interchangeable camera market in Japan (DSLR is the slightly bigger half), and that number isn't moving this year (contrary to what others have written). Mirrorless's percentage of the Japanese market rose rapidly in 2011 and peaked at just above 50% in February 2012. Since then, mirrorless has dropped to about 47% and remained relatively flat over the last eight months. Through the first ten months of the year, m4/3 captured about 57% of the mirrorless market in Japan, with Sony at 19% and Nikon at 13%. But the market is changing, partly due to recent releases, partly due to additional players entering. For example, the Canon EOS M quickly jumped to nearly 10% of the market and a top three position within 60 days of its launch, despite having only the two kit lenses available. Sony seems to have surged a bit with the release of the new 3 and 5 models and discounting of the ones that were replaced. In the second half of the year Sony has averaged near 25% of the mirrorless market in Japan. Surprisingly, Fujifilm hasn't made much of a dent in Japan, even the Pentax Q outsells the Fujifilm X-Pro1, and by a considerable margin. You'll see why in a moment. The 2013 mirrorless market is likely to look a lot different than the 2012 in terms of who's doing well and who isn't. Panasonic needs to reverse their collapse. Nikon isn't gaining any ground and needs to lower prices. Canon's EOS M has shot up the list of best selling cameras quickly (now in the top three), but that won't last without additional models or discounting. Sony seems to be gaining ground. Olympus continues to do well, but mostly with older, discounted models. I put some markers on those: * = previous model, while # = low-end model in line. So in that top ten list we have a total of six previous models, and seven low-end models. In other words, much of the volume of mirrorless is at the low end price-wise. This is true of interchangeable lens cameras in the Japanese market overall, too. The Nikon D3200 and Canon Kiss (Rebel) tend to be the leading DSLRs (and the entry models from Canon and Nikon were the top three interchangeable lens camera sellers in 2011 in Japan). The average selling price for mirrorless cameras in Japan so far this year is about US$625 (prices tend to be a bit higher in Japan than in the US, so take that into account). 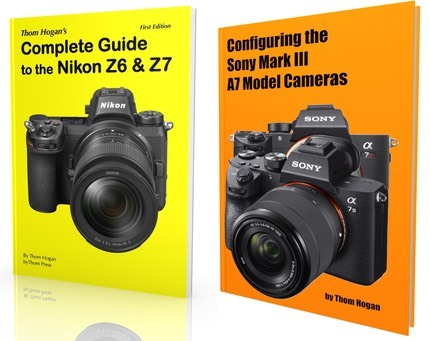 While a lot of the readers of this site are higher level enthusiasts and looking at models like the NEX-7, OM-D EM-5, GH2/GH3, V1, and X-Pro1, you'll note that they don't appear near the top of those best seller lists. I've written this before: we're going through the same thing that happened with film cameras, only faster. Companies that can't build or sustain a large market share eventually get marginalized by the ones that can. In the film SLR world, almost all of the volume eventually fell to just Canon and Nikon. The compact film cameras were decimated by instant photography and single use cameras. The danger is that the digital world will go the same way, with two or three companies dominating the interchangeable lens end, and smartphones decimating the compact digital camera markets. While m4/3 is doing well in Japan (27% of the overall interchangeable lens camera sales there), here in the US that figure is far, far lower (in the single digits). Note that Nikon just reported that they sold 37% of all interchangeable lens cameras worldwide in the first half of this year (and Canon's number was higher). So while m4/3 scrambles, they still have a lot of work to do ahead of them, and Panasonic's overall financial difficulties aren't helping. It's still too early to call winners in the mirrorless market, but I'll bet we'll have a good idea of how things will shape up long term within another year or so.